Background: Colorectal cancer (CRC) is one of the most common cancers worldwide and it is predicted that the number of cases will rise to 2.4 million by 2035. Therefore, preventative and therapeutic approaches are essential for the fight against cancer. The management of colon cancer through conventional methods mainly surgery, radiotherapy, and chemotherapy have produced unpredictable complications, especially metastasis and relapse of tumors, leading to loss of patient's life. In the last decade, association between oxidative stress and CRC has been intensively studied and it was found that the CRC has increased levels of oxidative stress markers. Natural dietary supplements provide a better choice for cancer prevention and treatments. Moringa oleifera (MO) generally known as the Miracle tree and most of the parts have high nutritional and medicinal properties; though, the leaves are suggested to have the highest concentration of vitamins, minerals, amino acids, and active compounds. Materials and Methods: The major purpose of the analysis was to investigate the dose-dependent cytotoxic and apoptosis-inducing effects of the hexane fraction of the MO extract on the colon cancer cells, HT-29. The anticancer potential of hexane fraction of MO extract was determined by 3-(4,5-dimethylthiazol-2-yl)-2,5-diphenyltetrazolium bromide assay and apoptotic mechanistic action by fluorescent staining, caspases, and immunoblot analysis. 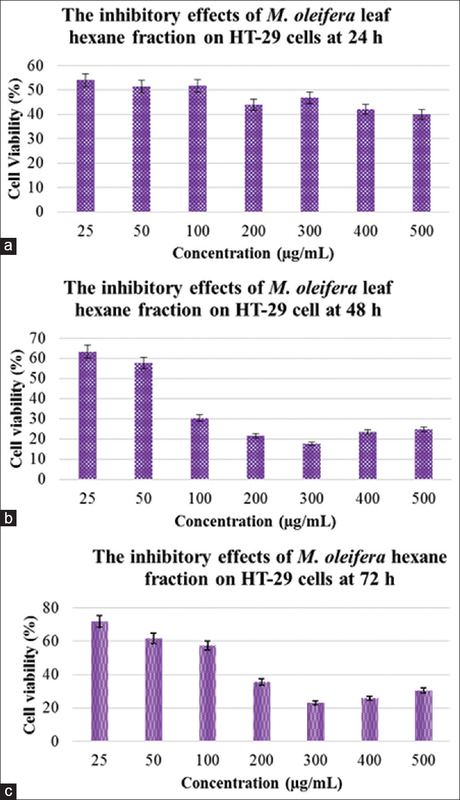 Results: The hexane fractions of MO extract suppressed the proliferation of HT-29 cells and induced apoptosis through mitochondrial apoptotic pathway. Conclusions: These findings suggested that hexane fraction of the extract has significant cytotoxic and apoptotic activity and therefore it could be discovered as a unique target for anticancer drug development. Abbreviations used: CRC: Colorectal cancer; MO: Moringa oleifera; HT-29: Colon cancer cells; HFMOL: Hexane fraction of Moringa oleifera leaves. Hexane fraction of MO induces the apoptosis through modulation of various apoptotic markers. Colon cancer is one of the leading causes of mortality worldwide, and in Malaysia alone, according to a study conducted on the occurrence of colorectal cancer (CRC) patients by gender and ethnicity, it is the most prevalent type of cancer diagnosed for men while the third among the women. The researchers reported that according to the GLOBOCAN project report proved that cases of CRC in Malaysia were the third utmost in South East Asia with the rate of 18.30/100,000. When compared with the neighboring countries, the rates of incidents are as follows: Singapore, Brunei, Philippines, Indonesia, and Thailand (33.70, 25.00, 13.10, 12.80, and 12.40 per 100,100, respectively). In a sequence, Brunei presented the peak mortality rate with 12.0 per 100,000 followed by Singapore, Malaysia, Indonesia, the Philippines, and Thailand with the rate of 11.8, 9.4, 8.6, 7.8, and 7.3 per 100,000, respectively. This shows the extent of seriousness of the colon cancer problem around South East Asia. Surveillance and screening for the early detection of CRC can save lives and it is made as easy as performing a simple blood screening testing for the presence of epigenetic biomarker septin 9 that is associated with CRC; however, many failed to detect it at the beginning stage as the symptoms may be subtle and it's also commonly known as a silent killer if it is undetected. To overcome or to prevent the development of the cancer, these are the most common types of cancer treatment such as surgery, chemotherapy, radiation therapy, targeted therapy as well as immunotherapy which involves techniques such as medications, hypothermia, and stem cell transplant, but most of them possess side effects and at high risk of developing secondary complications leading to loss of patient's life. Based on that, the urge in search for a better therapeutic agent for cancer is always in need to serve for different categories of patients as the currently available anti-CRC drugs might not be suitable for all patients in terms of their age and health background. Currently, numerous researchers focus on the screening of natural product-based therapeutic agents as a substitute to prevent and inhibit the several cancer cell growth without or with minimal side effects.,, Thus, a source with anticancer as well as anti-inflammatory-rich compounds is believed to serve a promising therapeutic agent. In line with that, a prospective miracle tree, Moringa oleifera (MO) was intended to be studied on its anticancer properties against colon cancer cells. Previous investigations have shown that MO has potent anticancer compounds such as kaempferol, rhamnetin and isoquercetin, zeatin, quercetin, beta-sitosterol, and caffeoylquinic acid which are associated with anticancer and anti-inflammatory properties. Specifically, the leaves of MO have a lot of essential nutrients and minerals with numerous pharmacological potential. The gastrointestinal tract (GIT) plays the vital roles in the digestive and absorptive of nutrients and minerals and supplies these to the body. Researchers have studied the dietary effects of MO leaves on the various metabolic actions in the GIT. In addition, other investigations have reported that consumption of MO dried leaf extract did not show any adverse effects in the in vivo animal studies including pathological findings and these results have suggested that consumption of MO leaves is rationally safe. Furthermore, it has been reported that edible parts of MO have countless scientific data proving its pharmacological properties which includes hepatoprotective,,, anti-inflammatory,,, wound healing,,, anti-microbial, and anti-diabetes. In the current study, we examined the inhibitory potential of hexane fraction of MO leaves extract (HFMOL) and categorized the related molecular mechanisms associated with its mechanism of action of anticarcinogenesis. The result evidently proves that HFMOL significantly inhibited the proliferation of HT-29 colon cancer cells and induce apoptosis through the mitochondrial apoptotic pathway. These findings suggested that hexane fraction of the extract has significant cytotoxic and apoptotic activity and therefore it could be discovered as a unique target for anticancer drug development. The well-grown MO leaves were harvested from Garden-No. 2, Universiti Putra Malaysia and these leaves were confirmed with Botanist and stored in Herbarium Section, Institute of Bioscience, Universiti Putra Malaysia, Malaysia. The extraction of leaves and isolation of various solvent fractions were processed according to the previously published procedure by our research team. The hexane fraction from MO leaves extract was isolated and used for this investigation. The human colon cancer cells, HT-29, were cultured DMEM media supplemented with 10% of fetal bovine serum and 1% of antibiotics. The cultured cells were maintained in a humidified incubator 5% CO2 at 37°C. The cultured healthy cells were harvested and seeded at a density of 1 × 104 cells in each well in 96-cell culture plate. The seeded cells were incubated overnight to allow them to adhere to the plate and then treated with different concentrations of the hexane fraction of MO (25, 50, 100, 200, 300, 400, and 500 μg/ml) for 24, 48, and 72 h. After the specific incubation period, cytotoxicity nature of fraction was measured using 3-(4,5-dimethylthiazol-2-yl)-2,5-diphenyltetrazolium bromide (MTT) reagent. This MTT assay was conducted according to the previously established method in our research group. Trypan blue exclusion method was performed in accordance to the previous reference. The colon cancer cells were subcultured and harvested then immediately seeded in a 60 mm Petri dish and incubated overnight to attach the cells in the culture plate. After the overnight incubation, the cells were treated with 100 and 200 μg/mL of HFMOL for 24 h. Then, cultured media were removed with fresh media after the specific incubation period. Finally, the cells were incubated in the incubator for 5 days to form colonies. Thereafter, surviving colonies were fixed with fixation solution and stained with crystal violet. The stained colonies with crystal violet were photographed using an inverted microscope. The migration rate of human colon cancer cells, HT-29, was observed using a wound scratch assay. The colon cancer cells were cultured/seeded in 24-well plate and incubated overnight to adhere the cells. Once reach the confluence rate, the wound was created by sterile 200 μl pipette tips, and cells were washed with phosphate buffered saline (PBS) to remove the debris. Cells were then observed under the microscope and photographed (0 h) then incubated with specific concentrations of fraction (100 and 200 μg/ml) and allowed to proliferate the cells in wounded areas at a specific time point (24 h). At the end, cells were washed with sterile PBS and then wound area was observed under the microscope. The apoptotic potential of hexane fraction of MOextract in inducing apoptosis in HT-29 colon cancer cells was evaluated by acridine orange (AO) and propidium iodide (PI) double staining. The colon cancer cells were plated at a density of 5 × 105 cells/well and incubated overnight. The seeded cells were then treated with different concentration of hexane fraction of MOextract for different time points. After the specific time period, cells were harvested and washed with PBS and then centrifuge to get clear cell pellets. The pellets were stained with an equal volume of fluorescent dye solution (1:1), comprising both 10 μg/ml AO and 10 μg/ml PI in PBS. Subsequently, stained cells were observed under the fluorescence microscope and images were obtained. The cells were cultured in a 6-well plate at a concentration of 1 × 105 cells in each well and incubated overnight. The following day, cells were treated with different concentration of hexane fraction for 24 h. After the specific incubation period, cells were detached and washed with PBS. Finally, cells were lysed with lysis buffer, and then the activity of caspase 3 was quantified according to the manufacturer's instructions (R and D Systems, USA). The cultured healthy colon cancer cells were seeded at a density of 1 × 105 cells/well in 6 well plates and incubated overnight to attach the cells. Then, cells were incubated with 20 μL of 2'-7'-dichlorodihydrofluorescein diacetate (DCFDA) (5 mg/ml) for 60 min. After the incubation period, the cultured media were removed and treated with different concentration of the hexane fraction at a specific time. Then, cancer cells were washed with sterile PBS and detached with trypsin to determine the reactive oxygen species (ROS) level. The intracellular ROS concentration was quantified by a fluorescence plate reader at excitation 480 nm and an emission wavelength of 520 nm. The cultured cells treated with different concentration (100 and 200 μg/ml) of hexane fractions for 24 h were harvested and extracted the protein according to the previously established methods. The harvested protein samples were subjected to polyacrylamide gel electrophoresis and transferred to PVDF membrane. After the transfer, polyvinylidene fluoride (PVDF) membrane was incubated with specific primary antibodies (Bax, Bcl-2, caspase 3, and β-actin as the control loading) and its appropriate secondary antibodies. Finally, the incubated membranes with antibodies were subjected to observe the signal using chemiluminescence system after added the chemiluminescence substrate. Results are expressed as a mean ± standard deviation from triplicate experiments and these results were analyzed using Student's t-test by GraphPad software(GraphPad Software Inc., San Diego, CA, USA). P < 0.05 values were reflected statistically significant. The cytotoxic effect of the HFMOL was evaluated on HT-29 colon cancer cells using the MTT cytotoxicity assay. The living cells contain a mitochondrial enzyme, succinate dehydrogenase, which cleaves the MTT yellow tetrazolium ring to an insoluble purple color formazan and the reduced formazan formed is unswervingly proportional to the number of viable cells. [Figure 1] shows the log dose-response curve for the 24, 48, and 72 h treatments. The results showed that HT-29 cells responded to the cytotoxic effects of HFMOL in a concentration- and time-dependent manner. The fraction concentrations above 50 μg/mL exerted a significant suppressed effect on the HT-29 cells subsequent 48 h and 72 h of exposure to HFMOL. 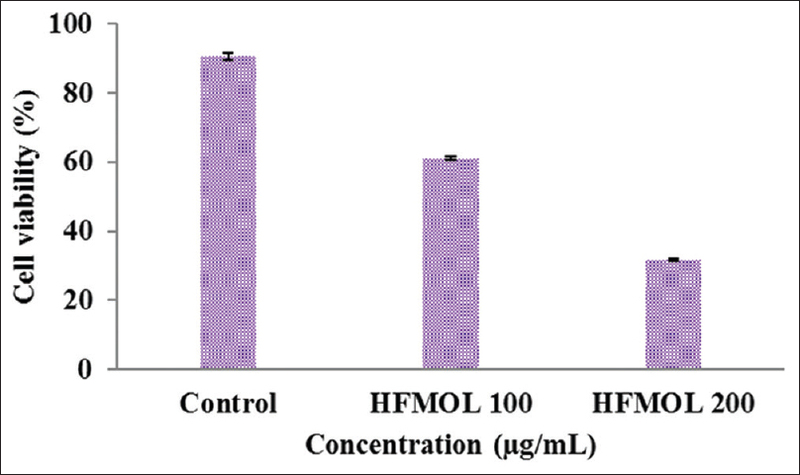 These results have shown beneficial anticancer activity of HFMOL on colon cancer cells; therefore, further antiproliferative activity of HFMOL on HT-29 colon cancer cells was examined using selective concentration of 100 and 200 μg/mL. The cell viability was evaluated using the trypan blue dye exclusion assay in HT-29 cells exposed to various doses of 100 and 200 μg/mL of HFMOL. It is based on the principle that live cells have intact cell membranes that disregard certain dyes, like trypan blue, unlike dead cells. The assay reaffirms the sensitivity of the HT-29 cells as presented in [Figure 2]. The inhibition concentration was compared with that of control. A concentration-dependent reduction in the percentage of cell number was observed with maximum reduction was observed at a higher concentration of 200 μg/ml. The antiproliferative action of the fraction was further evaluated using the clonogenic survival assay. This assay evaluates the potential of cells to develop into colonies unrestricted by growth contact inhibition, unlike normal growing cells that cease proliferation upon contact inhibition. As presented in [Figure 3], clonogenic survival of HT-29 cells reduces upon increasing concentration (100 and 200 μg/ml) compared to untreated control cells. Remarkably, HT-29 cell lines exhibited almost no colonies at extract concentrations of 200 μg/ml. 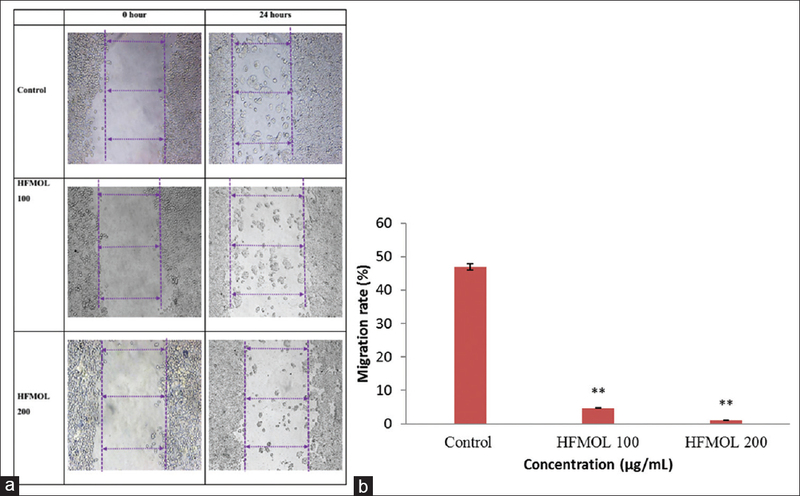 The effect of HFMOL on cell migration was examined up to 24 h by in vitro scratch assay [Figure 4]. Scratch assay was adapted to study the effects of HFMOL treatment on cell migration and invasion. The HT-29 cells were treated with various doses of HFMOL (100 and 200 μg/mL) and untreated cells; the cell migration observed at 24 h is almost 50%. The cell migration was inhibited by a maximum in the presence of increasing HFMOL concentration for 24 h. The microscopic data indicate that the anti-invasive effect was due to adhesion or membrane degradation and unlikely to be related to cell motility. The results from AO/PI double staining are depicted in [Figure 5]. AO/PI staining is a rapid and quantitative way of assessing apoptosis in cancer cells after the treatment. This method allows the morphological observation of apoptotic cells and distinguishes between apoptotic and necrotic cells. AO is permeable to both live and dead cells, stains all nucleated to green fluorescence. PI is permeable to compromised membranes and stains all dead nucleated cells, instigating orange/red fluorescence. From the data, the untreated HT-29 cells displayed a high number of green fluorescence cells and some apoptotic cells detected after 24 h incubation. It was clear that the number of viable cells decreased with increasing HFMOL concentration. The cells unveiled distinctive apoptotic cells characteristics such as plasma membrane blebbing and DNA fragmentation. However, at higher concentration (200 μg/mL), the number of cells stained red were increased. This result specifies most of the cells treated with 200 μg/mL of HFMOL were undergoing late apoptosis and necrotic cell death. To investigate the probable apoptotic molecular mechanism of by HFMOL in HT-29 colon cancer cells, the related protein expressions of apoptosis in HT-29 treated with HFMOL were evaluated by Western blot analysis. Western blot data showed upregulation of apoptosis incidence which controls cell growth through Bax and caspase 3 activation and Bcl-2 inhibition in dose-dependent manner [Figure 6]. In this study, HT-29 cells were treated with 100 and 200 μg/mL of HLMOF and incubated for 24 h to investigate the caspase-3 activity. Since caspase-3 is a general indicator of apoptosis, thus the possible mechanism of action can be determined. Treatment of cells with increasing concentrations of the HLMOF led to a dose-dependent increase in caspase-3 activity in the experiment. The increased concentration of ROS and/or meantime level of antioxidants reduction can activate mitochondrial-initiated actions prominent to apoptosis. 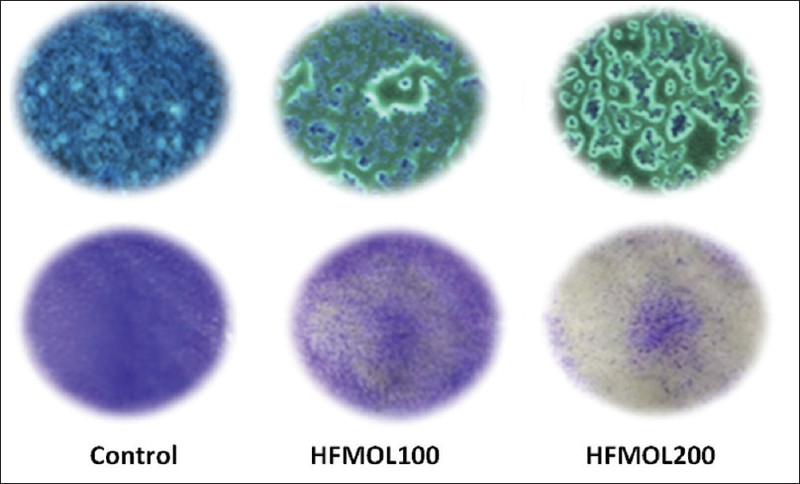 Thus, the HFMOL anticancer activity was examined to determine whether or not it initiates anticancer property through generation of ROS using the DCFDA probe, a cell permeable fluorescent dye. 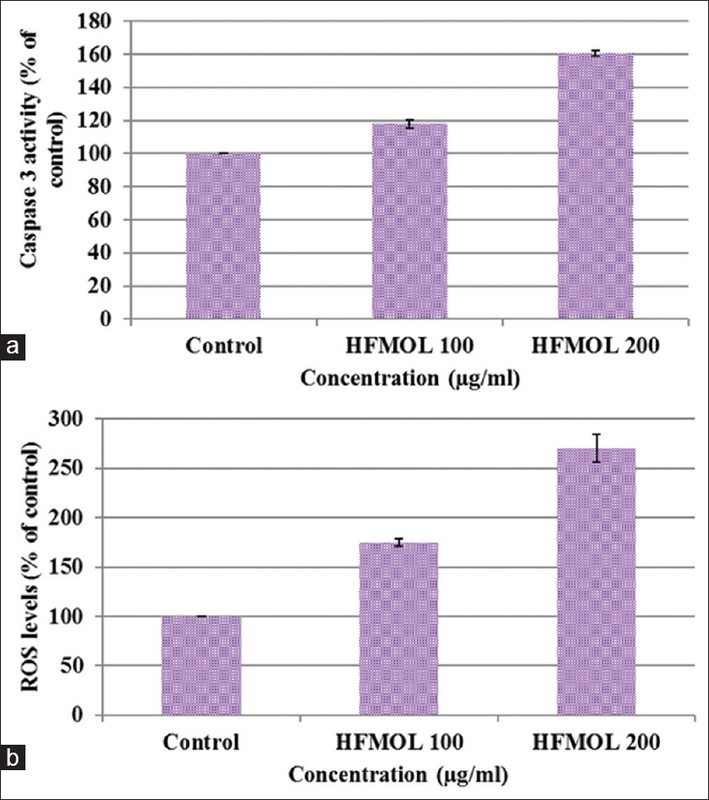 HT-29 cells were treated with 100 and 200 μg/mL concentrations of HFMOL for 24 h and induced ROS generation in a concentration-dependent manner [Figure 7]. There has been considerable attention in the exploration for potential chemotherapeutic agents in past few years against various types' cancers. Chemotherapy was defined as the usage of chemically active compounds to converse, suppress, and avert the progression of disease from preinvasive cancer to frank malignancy. Knowledge on dietary components controls the proliferation and cell survival. This understanding could play a crucial role in the development of new agents from natural products which can avert and treat cancer with minimal side effects, even though the overshadowing of current synthetic chemistry method used in drug discoveries and drug productions. In addition, drugs such as vinblastine, vincristine, taxol, and camptothecin which is derived from natural base had led to utmost extend within the proximity of antitumor where, the drugs were documented to improvisate the chemotherapy action of some cancers. Therefore, in this study, HFMOL was evaluated as new anticancer agent on HT-29 colon cells using MTT, trypan blue, clonogenic, scratch assays, and AO/PI staining. Plant-based traditional medicines have been accepted as leads for the development of therapeutic drug in modern medicine. MO leaf was selected in this study due to its use as an anti-inflammatory, antimicrobial, wound healing, and chemotherapeutic agent among the natives of Indians.,, Hence, the anticancer properties were evaluated using in vitro-based experiments. Previous studies have reported the presence of a vast number of active compounds in the plant including 4-(α-L-rhamnopyranosyloxy) benzyl isothiocyanate, pterygospermin, niazimicin, benzyl isothiocyanate, and 4-(α-L-rhamnopyranosyloxy) benzyl glucosinolate with various biological activities. These compounds are found in few dietary foods and own a great potential as candidates for drug development due to low toxicity which ensure safe consumption and extensive acceptance among the public. To understand the cytotoxicity characteristic of HFMOL on HT-29 colon cancer cells, MTT assay was selected to be investigated in this study. The findings of the study showed potent cytotoxic effects and the properties strengthen with increasing concentration of HFMOL on HT-29 cells. According to previous reference, GC-MS analyses showed the presence of D-allose in Moringa leaf. There is support that D-allose suppresses the growth of cancer cells at G1 phase (G1-cell cycle arrest) without exerting noticeable results on control cells. However, the reduction viable cell number might be due to an upturn of cell death and/or reduced cell proliferation. The quantity of viable cells after a 24 h and exposure to HFMOL was below the number of viable cancer cells at the initial incubation time concluding that HT-29 cancer cells might be further sensitive to HFMOL treatment at a concentration higher than 50 μg/mL with incubation time >24 h. This condition can take place due to a direct and long-term cytotoxic influence of the HFMOL, which may, in turn, designate apoptotic cell death. The cytotoxicity of HFMOL on HT-29 cell line was further established by exclusion assay of Trypan blue dye. Cell motility is hallmark of cancer progression and a cell that is not reproductively dead and has recollected the ability to divide and proliferate indeterminately can produce a large colony of cells which is referred as “clonogenic.” The capacity of a single cell to grow into an enormous colony is proof that it has retained its ability to replicate. In this study, the anti-clonogenic potential of HFMOL was investigated on HT-29 cancer cells. The treatment of HT-29 colon cells with HFMOL decrease of colony formation with increasing concentration. The loss of ability by HT-29 cells to form colony verifies HFMOL function as chemotherapeutic agents. Besides activity connected to the inhibition of the beginning of carcinogenesis, HFMOL also exhibited antimetastatic properties through migration assay. In the current study, HFMOL reduced invasiveness in a concentration-dependent manner and migration of HT-29 cells was unaffected in untreated cells (control). A literature search on natural compound disturbing the migration and invasion of cancer cells disclosed that flavonoids and alkaloids are the possible candidates which are related to such properties. In this regard, the flavonoid which is the main ingredient of HFMOL could be the plausible cause to inhibit tumor cell migration in HT-29 cells. Caspase-3, the enzyme is one of the vital executioners of apoptosis pathway since it is partially or entirely responsible for the cleavage of various critical proteins including the nuclear enzyme poly(ADP-ribose) polymerase. Initiation of caspase-3 involves proteolytic cleavage of its inactive zymogen into stimulated p17 and p12 fragments. We observed that the HFMOL induced the cleavage of caspase-3 in a concentration-dependent manner. One of the widely found flavanones in HFMOL is naringenin, and it has been reported to show a role in chemoprevention through the apoptosis pathway hence HFMOL exhibits the apoptosis signaling. This outcome indicates that initiation of the caspase-3 pathway may facilitate the pro-apoptotic potential of the HFMOL. Other investigations have reported that extreme quantities of ROS can cause oxidative damage to mammalian cells and also be noxious to cancer cells. Certain anticancer candidates have been stated to trigger apoptosis in cancer cells, by stimulating the formation of ROS. In the current study, the ROS level in HT-29 cells treated by HFMOL was augmented compared to control cells, which indicated that the HFMOL-induced apoptosis in HT-29 cancer cells necessitate the production of ROS and induced apoptotic cell death through a ROS-dependent mechanism. HFMOL might inhibit the ROS production by its rich antioxidants compounds such as isoorientin and chlorogenic acid. This is because such compounds have vicinal hydroxyl groups on an aromatic residue, which is to scavenge ROS. In our experiment, ROS level was progressively amplified escorted with the upturn of caspase-3 level [Figure 7], which taken the conclusion of Charles et al. 's study. To further elucidate the pathways of the cell death induced by the HFMOL, AOPI staining assays using fluorescent microscopy. The cell death mechanism was determined using AOPI staining by investigating the morphology of the cells treated with the HFMOL. Apoptotic features that cell shrinkage, nuclear and DNA fragmentation, and breaking up of the cell into membrane-bounded vesicles, named “apoptotic bodies” were evident in HT-29 cancer cells treated with HFMOL. The number of the cancer cells treated with of HFMOL was reduced in early apoptosis phase and augmented in late apoptosis over concentration-dependent manner. Bcl-2/Bax ratio can be recognized as an important factor in the regulation of the process of apoptotic due to it normalizes the release of mitochondrial cytochrome c to the cytosol. These proteins play a crucial role in regulating the apoptosis process in the mitochondria-dependent pathway. 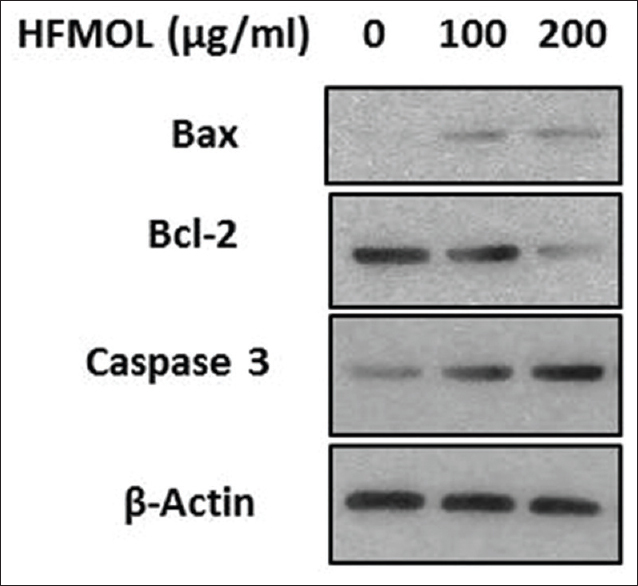 Our present findings showed that HFMOL promoted the expression of Bax (proapoptotic protein) and decreased the levels of Bcl-2 (antiapoptotic proteins) in a concentration-dependent manner [Figure 6]. According to the previous reference, the role of eugenol (which is also present in HFMOL) induces apoptosis in MDA-MB-231 by rising Bax protein expression. Present results are also in agreement with the reports as discussed above. The present interpretations provide preliminary data exposing HFMOL to have effective anticancer activity against HT-29 colon cancer cells. 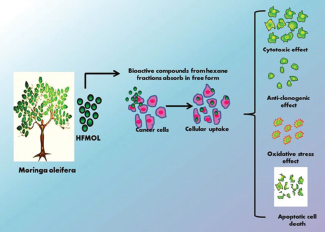 This proposes that the anti-cancer potential of HFMOL could be attributed to the bioactive constituents present in the fraction of the plant extract. These findings call for further studies on the identification of specific bioactive molecules for proper evaluation of their chemotherapeutic properties as well as their possible development as assuring potential anticancer drugs. Abu Hassan MR, Ismail I, Mohd Suan MA, Ahmad F, Wan Khazim WK, Othman Z, et al. Incidence and mortality rates of colorectal cancer in Malaysia. Epidemiol Health 2016;38:e2016007. Sameer AS, Nissar S. Epigenetics in diagnosis of colorectal cancer. Mol Biol Res Commun 2016;5:49-57. Arulselvan P, Wen CC, Lan CW, Chen YH, Wei WC, Yang NS, et al. Dietary administration of scallion extract effectively inhibits colorectal tumor growth: Cellular and molecular mechanisms in mice. PLoS One 2012;7:e44658. Pandurangan AK, Dharmalingam P, Sadagopan SK, Ganapasam S. Luteolin inhibits matrix metalloproteinase 9 and 2 in azoxymethane-induced colon carcinogenesis. Hum Exp Toxicol 2014;33:1176-85. Saadatdoust Z, Pandurangan AK, Ananda Sadagopan SK, Mohd Esa N, Ismail A, Mustafa MR, et al. Dietary cocoa inhibits colitis associated cancer: A crucial involvement of the IL-6/STAT3 pathway. J Nutr Biochem 2015;26:1547-58. Anwar F, Latif S, Ashraf M, Gilani AH. Moringa oleifera : A food plant with multiple medicinal uses. Phytother Res 2007;21:17-25. Zvinorova PI, Lekhanya L, Erlwanger K, Chivandi E. Dietary effects of Moringa oleifera leaf powder on growth, gastrointestinal morphometry and blood and liver metabolites in Sprague Dawley rats. J Anim Physiol Anim Nutr (Berl) 2015;99:21-8. Asiedu-Gyekye IJ, Frimpong-Manso S, Awortwe C, Antwi DA, Nyarko AK. Micro-and macroelemental composition and safety evaluation of the nutraceutical Moringa oleifera leaves. J Toxicol 2014;2014:786979. Sharifudin SA, Fakurazi S, Hidayat MT, Hairuszah I, Moklas MA, Arulselvan P, et al. Therapeutic potential of Moringa oleifera extracts against acetaminophen-induced hepatotoxicity in rats. Pharm Biol 2013;51:279-88. Fakurazi S, Sharifudin SA, Arulselvan P. Moringa oleifera hydroethanolic extracts effectively alleviate acetaminophen-induced hepatotoxicity in experimental rats through their antioxidant nature. Molecules 2012;17:8334-50. Singh D, Arya PV, Aggarwal VP, Gupta RS. Evaluation of antioxidant and hepatoprotective activities of Moringa oleifera Lam. leaves in carbon tetrachloride-intoxicated rats. Antioxidants (Basel) 2014;3:569-91. Arulselvan P, Tan WS, Gothai S, Muniandy K, Fakurazi S, Esa NM, et al. Anti-inflammatory potential of ethyl acetate fraction of Moringa oleifera in downregulating the NF-κB signaling pathway in lipopolysaccharide-stimulated macrophages. Molecules 2016;21. pii: E1452. Fard MT, Arulselvan P, Karthivashan G, Adam SK, Fakurazi S. Bioactive extract from Moringa oleifera inhibits the pro-inflammatory mediators in lipopolysaccharide stimulated macrophages. Pharmacogn Mag 2015;11:S556-63. Tan WS, Arulselvan P, Karthivashan G, Fakurazi S. Moringa oleifera flower extract suppresses the activation of inflammatory mediators in lipopolysaccharide-stimulated RAW 264.7 macrophages via NF-κB pathway. Mediators Inflamm 2015;2015:720171. Muhammad AA, Arulselvan P, Cheah PS, Abas F, Fakurazi S. Evaluation of wound healing properties of bioactive aqueous fraction from Moringa oleifera lam on experimentally induced diabetic animal model. Drug Des Devel Ther 2016;10:1715-30. Gothai S, Arulselvan P, Tan WS, Fakurazi S. Wound healing properties of ethyl acetate fraction of Moringa oleifera in normal human dermal fibroblasts. J Intercult Ethnopharmacol 2016;5:1-6. Muhammad AA, Pauzi NA, Arulselvan P, Abas F, Fakurazi S. In vitro wound healing potential and identification of bioactive compounds from Moringa oleifera lam. Biomed Res Int 2013;2013:974580. Viera GH, Mourão JA, Angelo AM, Costa RA, Vieira RH. Antibacterial effect (in vitro) of Moringa oleifera and Annona muricata against gram positive and gram negative bacteria. Rev Inst Med Trop Sao Paulo 2010;52:129-32. Gupta R, Mathur M, Bajaj VK, Katariya P, Yadav S, Kamal R, et al. Evaluation of antidiabetic and antioxidant activity of Moringa oleifera in experimental diabetes. J Diabetes 2012;4:164-71. Badmus JA, Ekpo OE, Hussein AA, Meyer M, Hiss DC. Antiproliferative and apoptosis induction potential of the methanolic leaf extract of Holarrhena floribunda (G. Don). Evid Based Complement Alternat Med 2015;2015:756482. Yamaguchi F, Takata M, Kamitori K, Nonaka M, Dong Y, Sui L, et al. Rare sugar D-allose induces specific up-regulation of TXNIP and subsequent G1 cell cycle arrest in hepatocellular carcinoma cells by stabilization of p27kip1. Int J Oncol 2008;32:377-85. Kviecinski MR, Felipe KB, Schoenfelder T, de Lemos Wiese LP, Rossi MH, Gonçalez E, et al. Study of the antitumor potential of Bidens pilosa (Asteraceae) used in Brazilian folk medicine. J Ethnopharmacol 2008;117:69-75. Yousefzadi M, Sharifi M, Behmanesh M, Moyano E, Bonfill M, Cusido RM. Podophyllotoxin: Current approaches to its biotechnological production and future challenges. Eng Life Sci 2010;10:281-92. Al-Asmari AK, Albalawi SM, Athar MT, Khan AQ, Al-Shahrani H, Islam M, et al. Moringa oleifera as an anti-cancer agent against breast and colorectal cancer cell lines. PLoS One 2015;10:e0135814. Kiesslich T, Gollmer A, Maisch T, Berneburg M, Plaetzer K. A comprehensive tutorial on in vitro characterization of new photosensitizers for photodynamic antitumor therapy and photodynamic inactivation of microorganisms. Biomed Res Int 2013;2013:840417. Rosangkima G, Jagetia GC. In-vitro anticancer screening of medicinal plants of Mizoram State, India, against dalton's lymphoma, MCF-7 and HELA cells. Int J Recent Sci Res 2015;6:5648-53. Lee SJ, Lee KW, Hur HJ, Chun JY, Kim SY, Lee HJ, et al. Phenolic phytochemicals derived from red pine (Pinus densiflora) inhibit the invasion and migration of SK-hep-1 human hepatocellular carcinoma cells. Ann N Y Acad Sci 2007;1095:536-44. Eun JK, Yong, JL, Hyun YS, Jung HY. Induction of apoptosis by the aqueous extract of Rubus coreanum in HT-29 human colon cancer cells. Basic Nutr Invest 2005;21:1141-8. Lowe HIC, Toyang NJ, Watson CT, Ayeah KN, Bryant J. HLBT-100: A highly potent anti-cancer flavanone from Tillandsia recurvata (L.) L. Cancer Cell Int 2017;17:38. Shang LH, Li CM, Yang ZY, Che DH, Cao JY, Yu Y, et al. Luffa echinata roxb. Induces human colon cancer cell (HT-29) death by triggering the mitochondrial apoptosis pathway. Molecules 2012;17:5780-94. Jinfeng YY, Soo M, Kim J. Isolation and characterization of bioactive compounds from Lepisorus thunbergianus (Kaulf.). Arabian J Chem 2015;8:407-13. Charles AK, Hisheh S, Liu D, Rao RM, Waddell BJ, Dickinson JE, et al. The expression of apoptosis related genes in the first trimester human placenta using a short term in vitro model. Apoptosis 2005;10:135-40. Alabsi AM, Ali R, Ali AM, Al-Dubai SA, Harun H, Abu Kasim NH, et al. Apoptosis induction, cell cycle arrest and in vitro anticancer activity of gonothalamin in a cancer cell lines. Asian Pac J Cancer Prev 2012;13:5131-6. Yang HL, Chen CS, Chang WH, Lu FJ, Lai YC, Chen CC, et al. Growth inhibition and induction of apoptosis in MCF-7 breast cancer cells by Antrodia camphorata . Cancer Lett 2006;231:215-27. Lacroix M, Toillon RA, Leclercq G. P53 and breast cancer, an update. Endocr Relat Cancer 2006;13:293-325.